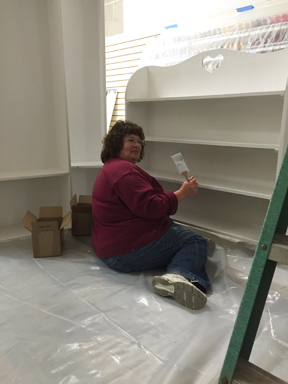 Our new Yarn Shop will officially open on April 2. Join us for a day full of demos, door prizes, food, and fun. 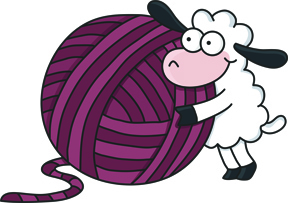 Please pass the word to all of your yarn-loving friends. 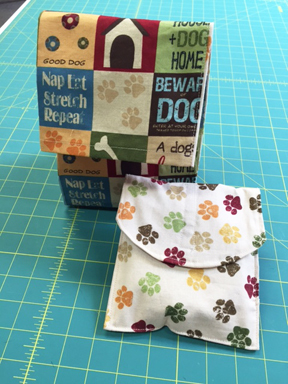 Students will make two items in this class – a snack bag and matching lunch bag, both lined with vinyl. Call today to sign up. Aimee King will be your teacher. 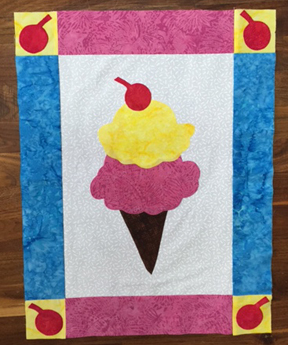 In this class students will learn the basics of applique by making an ice cream cone wall hanging. Aimee King will teach this class. 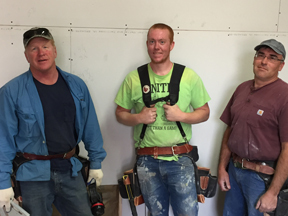 Click here for more information on our youth classes. We’ve had several requests for Snappy Slippers so it’s on the schedule again. Judy Bryan will teach this fun class on Friday, April 15. 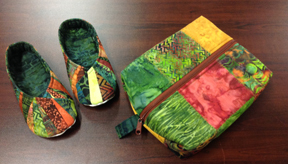 You can make the slippers and matching zippered carry bag from one pack of charm squares. Soft & Stable make the slippers comfy and non-skid fabric on the bottom make them safe to dash about the house in. These make great gifts. For your favorite graduate perhaps? Or Mother’s Day is coming up soon, too! Back by request . . . Ila Starks will teach her popular wrapped basket class on April 16. Makes fabric baskets in a variety of sizes and shapes using clothesline and strips of fabric. Sign up today. This class always fills quickly. Click here to see the full class schedule. How was your Monday? This is what we did today . 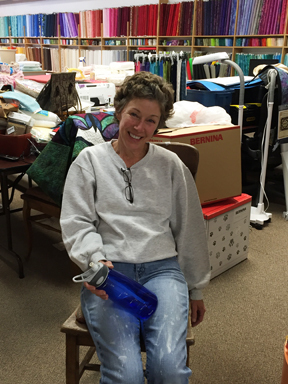 . .
Karen painted as well, and took a break amidst the chaos. Walt, Tim and Chris . . . awesome crew. Many thanks to our generous landlord Mitchell for helping to make this mess - um, I mean improvement - possible. 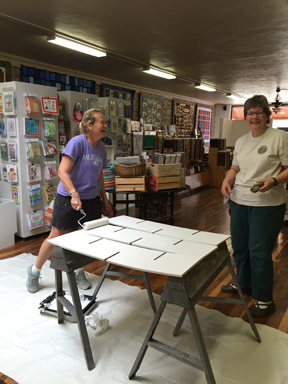 We'll reopen on Wednesday at 9 a.m.
Tuesday, April 12, 5:30 p.m.
Have fun creating abstract quilting designs in Artwork Canvas. The focus of the lesson is on the powerful blending tool in Corel Essentials. 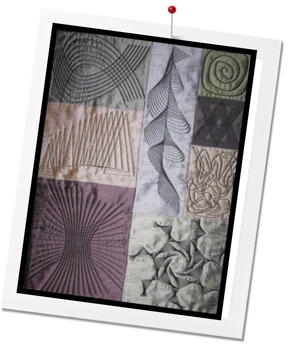 Learn to create all sorts of exotic blends and utilize Blackwork Run to eliminate jump stitches. Reshape, distort, and envelope tools will also be used. • Show and tell items for additional chances at a door prize. To sign up please email Cindy or call 970-565-7541 by Monday, April 11 at noon. The tip is on Spring Break and will return next week. about "FB Only" specials throughout 2016!